The new guide book will be provided as a gift included in the registration fee of every participant of the contest. The most important thing to know is of course the date, the contest will take place from 20th to 21st of April 2018. The registration will start on Friday the 20th of April at 12:00 noon and will end on Saturday 21st of April at 12:00 noon. 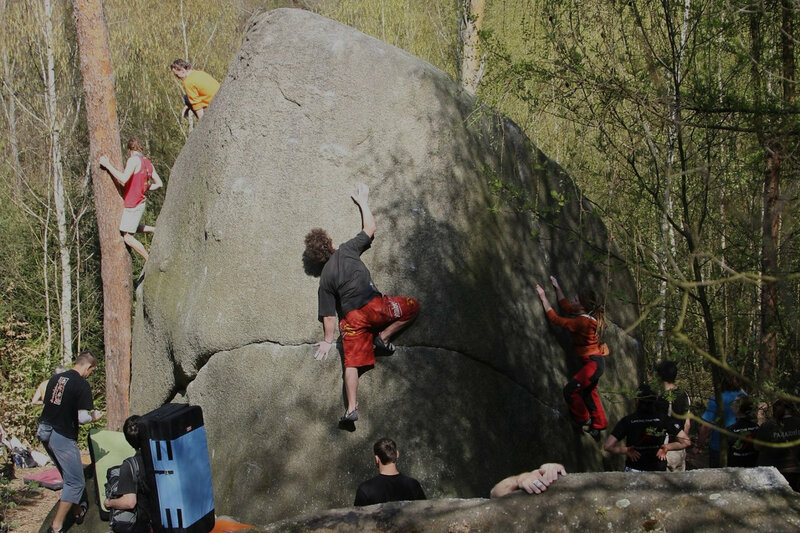 This year you will climb on boulders that were partially included in one of our previous years of Petrohradské padání and beside that we have prepared 120 brand new boulder problems, exclusively for this event. For this year, we have prepared more technical problems but your body strength won’t be wasted, no worries. The grades of these boulder problems range from 1Fb up to 8B+ Fb with few project problems even above this grade scale. The full scope for this year is more than 500 boulder problems for sure. The climbing area is just near the camping area so the approach is very good and the area is also pretty big so you don’t have to worry about crowds. The base for this year is again the “Sklárna” site near the Žihle village – with one difference for this year – we will be in the camping area with chalets across the street in comparison to the previous years when we have used the building area belonging to the summer school. In case that the capacity of 27 chalets won’t be enough then the accommodation in the school building will be open as well. You can also sleep in tents or cars or just under the sky within this marked area. Láďa Červinka will prepare the food as usual including the vegetarian dishes and a draught beer will be available as well. On the Saturday night, live music is on the list: the “Fanka” band and the band “MeGusta” which you might already remember from the previous years. The event will be driven in a peaceful and friendly atmosphere which is so typical for this contest. On Sunday, as usual, you can continue with bouldering without any stress to finish the rest of your finger skin. For more information please visit the www.padani.eu or the Facebook page.